From wild forest to the British seas - Red Army is the mightiest!" This is an art exhibition poster devoted to the Soviet Red Army. The exhibits included paintings, graphics, sculpture, textile works related to the events the Red Army took part into – the Civil War, World War 1, Soviet-Polish War. The Council of People's Commissars set up the Red Army by a Decree on January 28, 1918. In the 1918 the Red Army was quite democratic. The Army was based on the Red Guards which consisted of workers. At that time anybody could enlist, so the army contingent soon got very diverse. The discipline was weak and the orders were carried out according to its “Revolutionary significance”. The very idea of army hierarchy and strict obedience was considered to be bourgeois, and therefore contradicted with Communism. All this did not help to fight the enemies of the Soviet Union, so in short time the original tsar’s army system was restored. Many of the pre-revolution military specialists were drafted to make the Russian Army a professional and effective force. After coping with the most acute problems like intervention of Entente and offensives of the Whites, the ranks were combed-out thoroughly, leaving only the representatives of Workers’ and Peasants’ classes in the Red Army. Being a military man signified one’s political loyalty and devotion to communist ideals. The Soviet Union was a state of Workers and Peasants, so the Red Army was the people’s army. The poster above was created by Alexander Deyneka – a brilliant and impressive artist. He was famous of his patriotic and battle-paintings. Here is one of his masterpieces named “Defense of Sevastopol”. 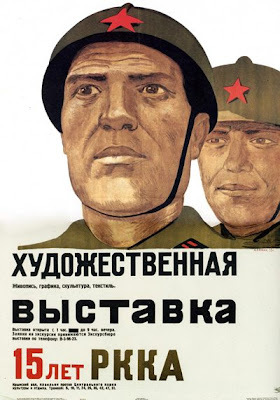 On this Red Army poster he pictured two soldier’s heads in helmets. The style is simple, and the face expressions are plain. They are determined and open, truly men of the people. The soldiers are sincere, frank, and of the people. From what I've recently learned of Hitler's defeat, the Red Army is also a mobile, well trained and well equipped force. Thanks for finding this one. I remember the American posters that displayed Soviet soldiers during the 50's - 60's. They were just as powerful as the posters you have shown on this blog. Once again love these posters. My brother was graphic artist I wish he was still alive to see these.He'd love them too.